Iowa Learning Farms hosts 25-30 field days and workshops each year. Topics cover a variety of conservation practices like cover crops, strip-tillage, no-tillage, bioreactors, wetlands and prairie strips. The events are opportunities to hear from local farmers and landowners implementing the practices, but also researchers and technical experts to provide current information and tips for success. Plan to attend a field day or workshop near you by subscribing to our e-newsletter and checking our events page. Iowa Learning Farms partners with Water Rocks! to bring audiences the Conservation Stations Trailers—three mobile learning centers that educate audiences of all ages on different conservation aspects. The Conservation Stations travel the state visiting field days, county fairs, farmers markets and other community events. It is staffed by the Iowa Learning Farms/Water Rocks! team and is available for single-day events. Two of Conservation Stations house a rainfall simulator demonstrating the effects of rainfall on undisturbed soils with a variety of soil covers and impervious and porous surfaces and the NEW! Conservation Station On the Edge features working models of a bioreactor and saturated buffer. 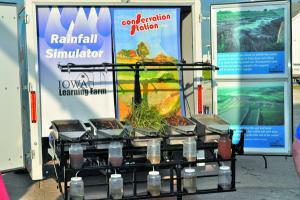 To request the Conservation Station rainfall simulator, complete the Online Form. For Conservation Station On The Edge requests, please email Liz Juchems, events coordinator, at ejuchems@iastate.edu. The Conservation Station team reserves the right to select which trailer will be at your event. To address social factors influencing the adoption of conservation practices, the Conservation Learning Group is helping develop an emerging farmers program. The goal is to engage underserved agricultural populations, limited resource farmers and future landowners. These emerging farmers are those with ties to agricultural land, not currently farming but would like to return to the farm or have a voice in its management. This project will lead to the development of resources and delivery of information through webinars, field days, videos, print materials and other outreach methods. 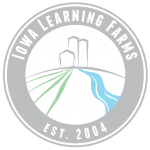 Established in 2004, Iowa Learning Farms is building a Culture of Conservation, encouraging adoption of conservation practices. Farmers, researchers and ILF team members are working together to identify and implement the best management practices that improve water quality and soil health while remaining profitable. Partners of Iowa Learning Farms are the Iowa Department of Agriculture and Land Stewardship, Iowa State University Extension and Outreach, Leopold Center for Sustainable Agriculture, Iowa Natural Resources Conservation Service, Iowa Department of Natural Resources (USEPA section 319); in cooperation with Conservation Districts of Iowa, the Iowa Farm Bureau and the Iowa Water Center.